A Gecko Under the Tree? A lizard living in your home, on purpose, may give some parents pause. However, if your child is a budding herpetologist, a leopard gecko may be the perfect place to begin. There are many fascinating and beautiful species of geckos in the pet world, but the leopard gecko is readily available, attractive, affordable, and what we call an easy-keeper. Geckos also have the advantage of being docile and easy to handle, and they require a moderate amount of care-time every day. While people are rarely allergic to geckos, they do shed. If the gecko’s environment is not cared for properly, dust from shed skin and food items can build up, causing reactions in people with dust allergies. A good pet store will stock all the items you need. A ten-to twentygallon aquarium (length is better than height) will provide a nice environment for your new pet. Geckos do not need to live in groups; in fact, more than one male in an environment may lead to fighting and injuries. For the bottom of the cage, you will want something easy to clean. Newspaper, reptile carpet, paper towels, or paper pulp products work well. Others, such as sand or mulch, can appear more natural, but in captivity, the animals can accidentally ingest these. Easy-to-clean reptile furniture is available at the pet store to enrich the environment. This includes structures for hiding and climbing. A small cave or cave-like structure should be provided. You can put moistened paper towels inside, which helps keep the gecko’s skin hydrated and helps them shed properly. Reptiles are cold-blooded, meaning the temperature of their body depends on the temperature of the environment. You will need to provide a cool side (70° to 75°F) and a warm side (80° to 90°F) to the aquarium. The best method is to purchase an under-the-tank heater as well as above-the-tank lights and heat. Tank thermometers help you monitor the temperature ranges. 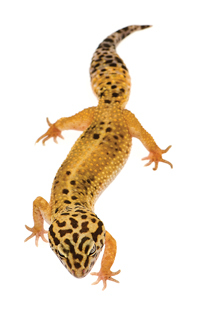 Leopard geckos will thrive on insect diets. Crickets are the most common food item, but wax worms or meal worms can also be offered occasionally. Juvenile geckos are fed daily. Four or five of the weekly cricket meals should be dusted with a calcium/vitamin D3 supplement, and the other two days, dusted with a multivitamin. To do this, place the crickets in a bag with the supplement powder and shake to coat. You can train your gecko to eat from a feeding station or in a feeding box. A feeding station, such as a ceramic crock, can be used in the aquarium. A feeding box, such as a plastic shoe box, is even better. The gecko and the food items are placed in the box once daily for about thirty minutes. With this training method, you will know that your gecko is eating well, and you will not contaminate the environment with insect residue or find yourself searching for an escaped meal. Geckos rarely become ill as long as they are provided with a good environment, proper lighting, heat, the right diet, and fresh water. 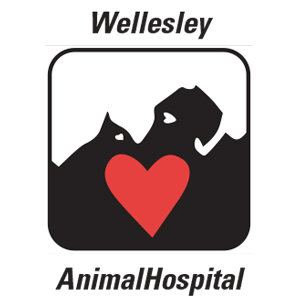 Decreased appetite, wounds, swollen or crooked limbs, trouble walking, swelling, or discharge of the mouth or eyes are signs that veterinary care is needed. Handling by the tail is not recommended as it can break off. This is a great strategy if a predator has a gecko by the tail, but not a great strategy if your child owns the gecko. The tail can regenerate, but won’t restore itself to normal. A geckos’s fat tail, a health meter of sorts, is an excellent way to know it is healthy and happy.